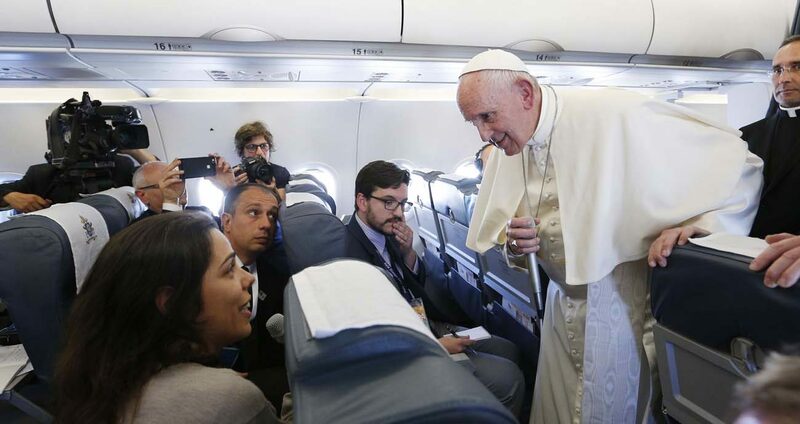 ABOARD THE PAPAL FLIGHT FROM PORTUGAL (CNS) — While the investigations into the very first alleged apparitions at Medjugorje in must continue, Pope Francis said he has doubts about claims that Mary continues to appear in the village of Bosnia-Herzegovina. In February, Pope Francis appointed Polish Archbishop Henryk Hoser of Warsaw-Praga to study the pastoral needs of the townspeople and the thousands of pilgrims who flock to Medjugorje each year. He told reporters those people deserve spiritual care and support. Also during the in-flight news conference, the pope was asked about his meeting with U.S. President Donald Trump, who will visit the Vatican May 24 as part of his first foreign trip as president. “There are always doors that aren’t closed. Look for the doors that at least are a little bit open, enter and speak about things held in common and go forward, step by step,” the pope said. “Peace is artisanal; it is made every day. Even friendship among people, mutual knowledge and esteem are made every day,” he said. Pope Francis also was asked about the resignation of Marie Collins, one of the founding members and the last remaining abuse survivor on the Pontifical Commission for the Protection of Minors. She left the commission March 1, citing the reluctance of members of the Roman Curia to implement recommendations or cooperate with the commission’s work. The pope praised Collins’ work on the commission and her continuing role in training bishops to deal with abuse allegations. However, the pope said the delays in handling cases are due to the need to draft new legislation and to the fact that there are few people capable of handling cases of sexual abuse. He has made overtures to the faithful attached to the society by recognizing the validity of absolution granted by SSPX priests and the validity of marriages they celebrate, but the Vatican still is waiting for the society’s leadership to sign a document affirming certain teachings of the church.